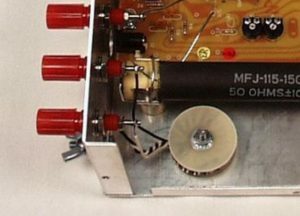 Above is a pic of the MFJ-949E Ruthroff 4:1 balun. 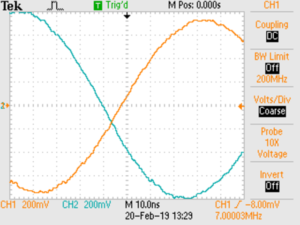 The transmission line is not uniform, but let’s make an approximation to predict its behavior with a centre tapped 100Ω load, the centre of which is connected to the ground terminal. The following is a model using TWLLC of a similar transmission line with 50+j0Ω load (one half of the load is connected to the transmission line). We will assume that Zcm of the TLT is very high. Among all that detail is an estimate of Vout/Vin, it is 9.252e-1∠-21.9°. 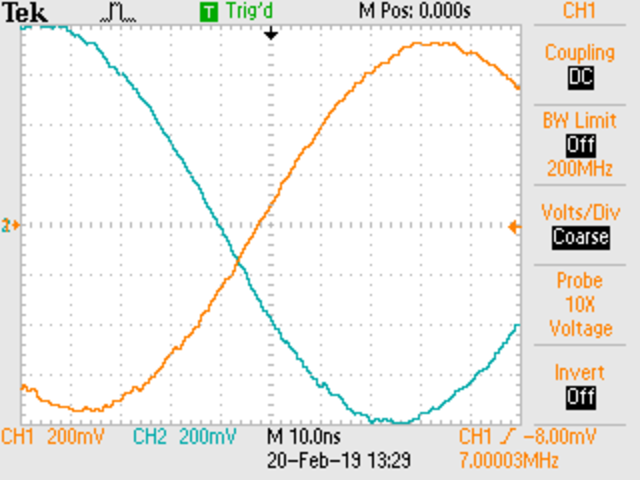 That is to say that if there is 1.0V on the ‘direct’ balun terminal, the other terminal via the transmission line will be 0.9252∠-21.9° V.
Since the current in each of our 50Ω 1% load resistors is V/50, we can calculate the common mode current by summing them, and it will not be zero because of the lower voltage and particularly the significant phase delay of the ‘indirect’ terminal. 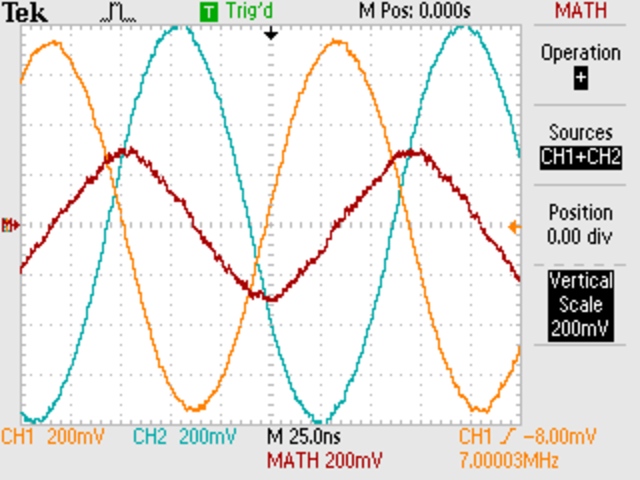 We can also use the scope to add the waveforms to find the common mode component. Above, the calculated phase difference is 22° which reconciles well with the estimate from the scope trace delay above. It also reconciles well with the theoretical prediction earlier. 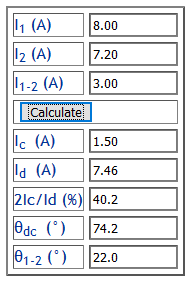 The ratio 2Ic/Id is 40%, this is pretty awful current balance on a symmetric load. 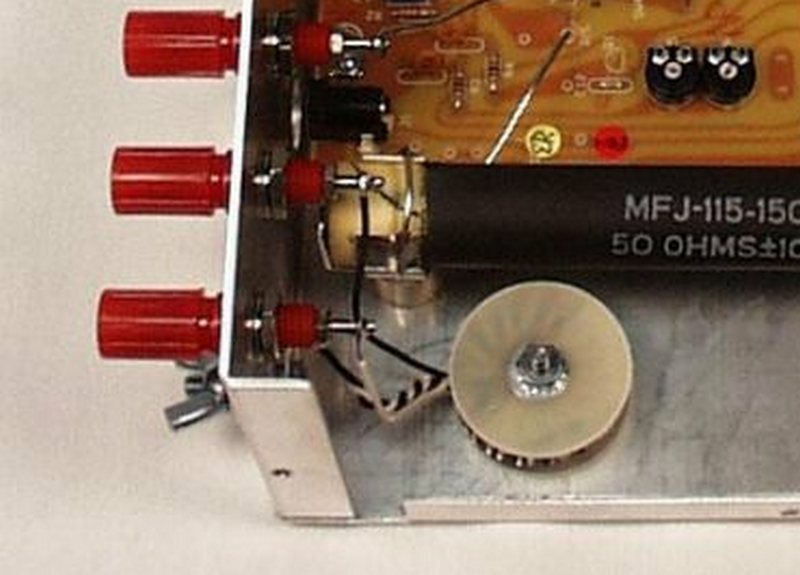 This is quite a small balun physically, larger baluns will have longer transmission line and greater phase delay, so even worse performance on a perfectly symmetric load. 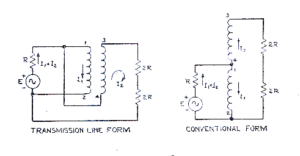 So, whilst ideal voltage baluns deliver equal but opposite currents into a perfectly symmetric load, practical Ruthroff 4:1 voltage baluns might not be all that good. 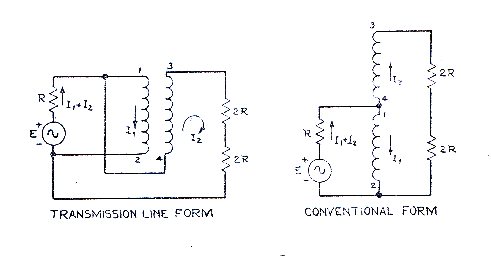 Measured behavior of the Ruthroff 4:1 voltage balun accords with prediction using Ruthroff’s transmission line model of the device.